This work seeks to validate postoperative Anterior Chamber Depth (ACDpost) mesurement devices based in optical low-coherence reflectometry (Lenstar LS 900, (Haag-Streit AG, Köniz, Switzerland) and optical coherence tomography (Visante OCT, Carl Zeiss Meditec Inc., Dublin, California, USA). A pseudophakic eye phantom was built to check the calibration of both devices. 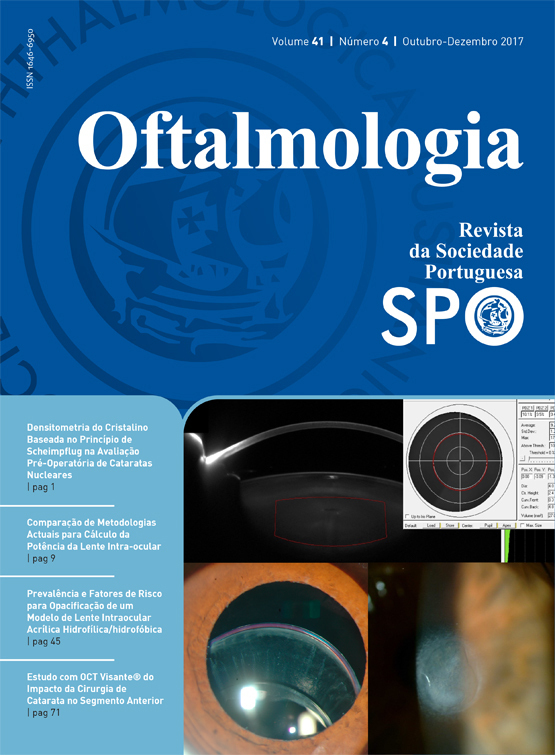 A clinical study involving 40 pseudophakic eyes was conducted and 3 months after surgery ACDpost was measured with both devices and compared. Zeiss Visante calibrations had a R.M.S error smaller than the device’s 18 μm resolution in all the measurement sets. No span shift nor zero shift errors were found. Lenstar calibrations had a larger R.M.S error in the order of the device’s 20 μm resolution. In the clinical study, Lenstar failed to measure ACDpost 11% of the times. Additionally Lenstar measured an average IOL thickness of 0.74μm with σ = 0.08mm and a 16% failure rate. Bland-Altman (BA) analysis was performed and a mean difference of 74μm between the measurements was found. The dioptric shift induced by the difference between measurements was calculated in a worst case scenario and a 0.18D difference was found. This is clinically insignificant and the measurements can be considered to be interchangeable. Both devices performed accurate measurements of ACDpost. Results from the clinical trial proved the interchangeability of the measurements in vivo. This will certainly contribute to the improvement of ACDpost estimation methodologies and ultimately contribute to the improvement of IOL power calculation methodologies.